1. 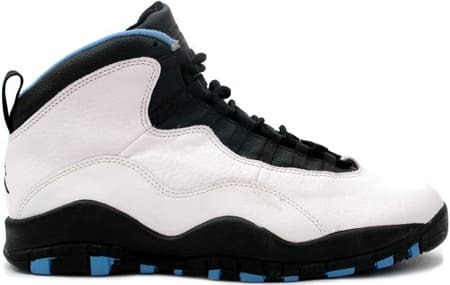 Air Jordan X "UNC"
The white and black with accents colorway screamed "City Pack," but the Dark Powder Blue hits on these Xs took things all the way back to Chapel Hill. Nike had long paid respects to Mike's Tar Heels with UNC-themed joints (even the Air Jordan 1 was produced in baby blue), but with the IXs and Xs, they actually found their way onto the feet of the ACC's finest, most notably high-flying wingman Jerry Stackhouse. Given Carolina's continued success and their official Jordan sponsorship, it's stunning these have yet to return.